High-flying 8-bit bikes and action packed racing, could a racing game get any better? 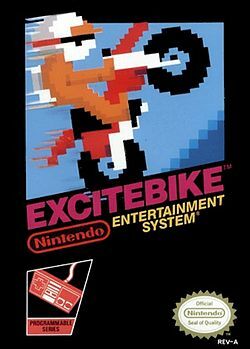 ExciteBike is a motorcycle racing game released in 1985 by Nintendo for the NES (Nintendo Entertainment system). In 1984 it was released on the Famicom in Japan. There is no story in the game, your main goal is to beat your time or beat the AI (Artificial Intelligence). There are two game modes in the game. There is Selection A, where you race solo against your time, and Selection B, where you try to beat the CPU players. As far as physics go, I am not a master physicist but I’ve never seen better in my whole life. It’s a really fun game to play when you get into it and it is a great game when you only have a few minutes free to play. As far as the graphics go, they are the best graphics I have ever seen. I had the impression of being right beside my racer feeling the motor roar underneath my feet in the stadium. Seriously though, I love the retro look all games had at that time. Having the ability to create your own track is probably the only reason I played the game. You’re not very good at avoiding traps? Just make a lane without any and be sure to win! If you are skilled enough you can even bypass the maximum length of the track by a lot because of a little glitch (Just add a really huge ramp right in front of the finish line so it gets pushed away). 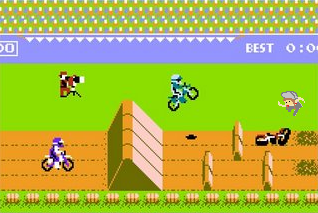 Overall, ExciteBike is a really fun game to play, it can be frustrating getting the hang of it at first and falling from your bike can really slow you down. I think everyone would enjoy the game if they played it. And remember that the game came out in 1985! Don’t play having high expectations like you would for games in 2012. This entry was posted in Classics and tagged bike, excite, excitebike, motorcycle, nes, nintendo, race, racing, wheelie. Bookmark the permalink.